A letter from Kerrilyn, with whom I have laughed with in Canada, Romania, Bulgaria, Turkey, Japan, South Korea, Thailand, and Myanmar. We are planning to travel for five months together through Central and South America later on this year, and plan to one day open up a guesthouse on a little beach somewhere. She’s my best friend. Let’s just acknowledge that I’m writing to you while both of us are in Canada. 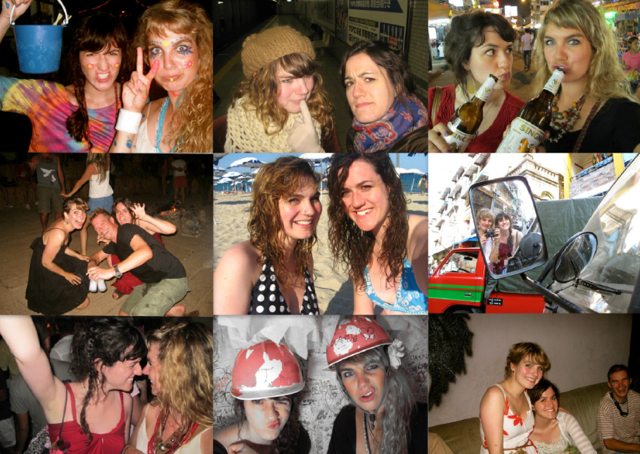 The last time we were both in Toronto together was just before you were moving to Japan (in 2008). We were in your mum’s apartment overlooking the skyline and treetops, wondering what our new Asian lives would bring us. If only we could have shown ourselves the visits in Osaka – the overeating of cabbage, the shopping in Amemura, the okonomiyaki, the Asahi, the friendship that we nurture and grow with every new adventure. Could we have told ourselves that we would visit Burma together? That we would make friends, if only for a few hours, with locals so warm and kind they dress up their daughter in gold makeup and a wig? That we would dance the night away to “Barbara Streisand” on the beach in southern Thailand for two nights straight? That we would both make such a consistent effort to keep in contact, despite our distance? That Brennalyn would travel solo all over Asia and India for eight months and send a box of memories to Kerrilyn? That Kerrilyn wears the yak wool scarf from Nepal as she writes? Could we have told ourselves any of these things? Where are our lives going to take us? Will our dreams of typewriters and hostels and cups of coffee and land on an unknown beach somewhere pan out? I have no doubt. Love the new look of the blog. You are both amazing! BFF’s are the best! this collage of us is my background photo on my computer and everyone is like WHO IS THAT BEAUTIFUL GIRL!!!! i demand that we stop everything we’re doing and start taking over the world like we know we can. La Full Moon c’est un truc de dingue !! !